"IT'S ALMOST an eighteenth-century situation," is how the members of the London Saxophone Quartet describe their professional life. The staple diet of nearly every other comparable chamber ensemble is provided by the great works of the past, but their repertoire derives almost entirely from the present century—much of it from the past few years. And as the only professional saxophone quartet in Britain they have few opportunities to learn what other' are doing in the same field " The first time we heard a saxophone quartet live was when we went to Toronto," says Christopher Gradwell, tenor saxophone and business manager. 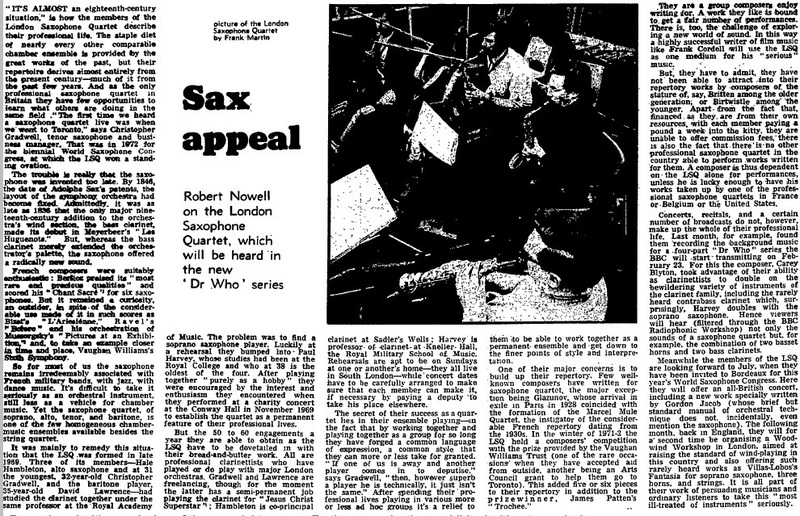 That was in 1972 for the biennial World Saxophone Congress, at which the ISQ won a standing ovation. The trouble is really that the saxophone was invented too late. By 1846, the date of Adolph, Sax's patents, the layout of the symphony orchestra had items fixed. Admittedly, it was as late as 1836 that the only major nineteenth-century addition to the orchestra's wind section, the bass clarinet, made its debut in Meyerbeer's 'Les Eluguenota." But, whereas the bass clarinet merely extended the orchestrator's palette, the saxophone offered a radically new sound. French composers were suitably antbusiside : Berloiz praised its " most rare end precious qualities" and scored his Chant Sacre for six saxophones. But it remained a curiosity, an outsider, in spite-of the considerable use made of it in such scores as Inure "L'Arkeienne," Ravel's "Bolero" and his orchestration of Mussorgsky's "Pictures at an Exhibition," and, to take an example closer in time and place, Vaughan Williams's Sixth Symphony. So for most of us the saxophone remains, irredeemably associated with French military bands, with jazz, with lance music. It's difficult to take it seriously as an orchestral instrument, still less as a vehicle for chamber music. Yet the saxophone quartet, of soprano, alto, tenor, and baritone, is me of the few homogeneous chamber-music ensembles available besides the string quartet. It was mainly to remedy this situaion that the LSQ -was formed in late 1969. Three of its members—Hale Hambleton, alto saxophone and at 31 he youngest, 32-year-old Christopher Gradwell, and the baritone player, 15-year-old David Lawrence—had studied the clarinet together under the same professor at the Royal Academy of Music. The problem was to find a soprano saxophone player. Luckily at a rehearsal they bumped into Paul Harvey, whose studies had been at the Royal College and who at 38 is the oldest of the four. After playing together " purely as a hobby " they were encouraged by the interest and enthusiasm they encountered when they performed at a charity concert at the Conway Hall in November 1969 to establish the quartet as a permanent feature of their professional lives. But the 50 to 60 engagements a year they are able to obtain as the LSQ have to be dovetailed in with their bread-and-butter work. All are professional clarinettists who have played or do play with major London orchestras. Gradwell and Lawrence are freelancing, though for the moment the latter has a semi-permanent job playing the clarinet for "Jesus Christ Superstar " ; Hambleton is co-principal clarinet at Sadler's Wells ; Harvey is professor of clarinet at Kneller Hall, the Royal Military School of Music. Rehearsals are apt to be on Sundays at one or another's home—they all live in South London while concert dates have to he carefully arranged to make sure that each member can make it, if necessary by paying a deputy 'to take his place elsewhere. The secret of their success as a quartet lies in their ensemble playing—in the fact that by working together and playing together as a group for so long they have forged a common language of expression, a common style that they can more or less take for granted. " If one of us is away and another player comes in to deputise," says Gradwell, " then, however superb a player he is technically, it just isn't the same." After mending their ' professional lives playing in various more or less ad hoc groups it's a relief to the in -to be able to work together as a permanent ensemble and -get down to the finer points of style and interpretation. One of their major concerns is to build up their repertory. Few well-known composers have written for saxophone quartet, the major exception being Glazunov, whose arrival in exile in Paris in 1928 coincided with the formation of the Marcel Mule Quartet, the instigator of the considerable French repertory dating from the 1930s. In the winter of 1971-2 the LSQ held a composers' competition with the -prize provided by the Vaughan Williams Trust (one of the rare occasions= when they have accepted aid from outside, another being an Arts Council grant to help them go to Toronto). This added five or six pieces to their repertory in addition to the prizewinner, James Patten's " Trochee." They are a group composers enjoy wilting for. A work they like is bound to, get a fair number of performances. There is, too, the challenge of exploring a new world of sound. In this way a highly successful writer of film music like Frank Cordell will use the I1Sct as one medium for his "serious music." But, they have to admit, they have not' been able to attract .into their repertory works by -composers of, the stature of, say, Britten among the older generation; or Birtwistle among' the younger. Apart from the fact that, financed . as they, are from their own resources, with each member paying a pound a week into the kitty, they are unable to offer commission fees: there is also the fact that. there' is .no other professional saxophone quartet in the country able to perform _works written for them. A composer its thus dependent on the LSQ alone for performances, unless he is lucky, enough to have -his works taken up by one of the professional saxophone quartets in France or-Belgium or the United States. Concerts, recitals, and a certain number of broadcasts do not, however, make up the whole of their professional life. Last month, for example, found them recording the background music for a four-part "Dr Who" series the BBC will start transmitting on February 23. For this the composer, Carey Blyton, took advantage of their ability as clarinettists to double on the bewildering variety of instruments of the clarinet family, including the rarely heard contrabass clarinet which, surprisingly, Harvey doubles with the soprano saxophone. Hence viewers will hear (filtered through the BBC Radiophonic Workshop) not only the sounds of a saxophone quartet but, for example, the combination of two basset horns and two bass clarinets. Meanwhile the members of the LSQ are looking forward to July, when they have been invited to Bordeaux for this year's World Saxophone Congress. Here they will offer an all-British concert, including a new work specially written by Gordon Jacob (whose brief but standard manual of orchestral technique does not. incidentally, even mention the saxophone). The following month, back in England, they will for a' second time he organising a Woodwind Workshop in London, aimed at raising the standard of wind-playing in this country and also offering such rarely heard works as Villas-Lobos's Fantasia for soprano saxophone, three horns, and strings. It is all part of their work of persuading musicians and ordinary listeners to take this " most ill-treated of instruments " seriously. APA 6th ed. : Nowell, Robert (1974-02-02). Sax appeal. The Guardian p. 8. MLA 7th ed. : Nowell, Robert. "Sax appeal." The Guardian [add city] 1974-02-02, 8. Print. Turabian: Nowell, Robert. "Sax appeal." The Guardian, 1974-02-02, section, 8 edition. This page was last modified on 10 January 2015, at 00:08.